Sitting midway between Boston and New York City, Meadowbrook Estate offers a serene and sophisticated escape from the bustling city life in a beautifully renovated colonial estate nestled in the rural countryside of Connecticut. 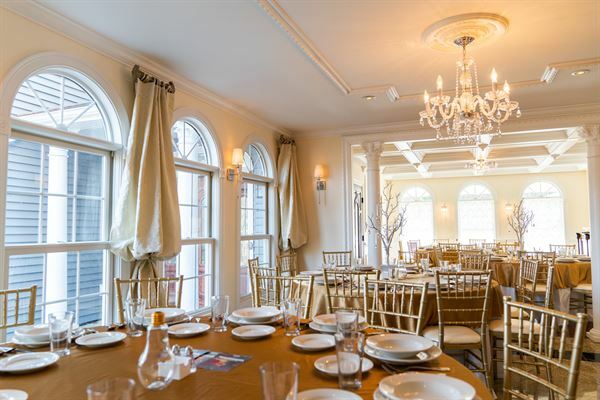 Specializing in elegant accommodations for everything from wedding parties to corporate retreats, the Estate's 8,000-square foot event venue warmly welcomes its guests with spacious, sun-drenched rooms and Italian-inspired details around every corner. Meadowbrook Estate offers eight private Bedroom Suites-each Suite unique in design with its own full, marble or Etruscan-tiled bathroom, jet stream shower or jetted tub. The Grand Dining Room, with polished and heated granite floors, is split into two large airy rooms to be used for entertaining. Our indoor event space can be a seated affair for up to 50. We can host a larger event with guests flowing throughout the Estate and our covered porches. Our beautiful grounds can hold a tented affair. Able to accommodate occasions of all kinds, the 1500-sq ft Special Occasion Sitting Room, with its own private entrance, can be used as a preparation space for everyone with a hair and makeup team, and photographer. Our Groomsmen Lounge is a completely separate area for preparing for an event. With something for everyone, Meadowbrook Estate offers each guest an elegant and unforgettable experience, specially tailored to their needs and wishes. Whether it's holding a rehearsal dinner, renewing one's vows, celebrating the bridal party,a wedding, a wellness or corporate retreat, or more. The Estate has a full-list of event planners, caterers, private chefs and other services for any-sized event, from the showers, to birthday parties, to weddings. Our 1500-sq foot Suite with private entrance can host you special event preparation needs. We have a full array of hair and makeup teams, photographers, and event planners.